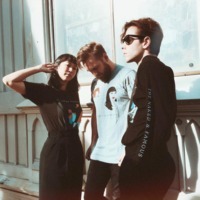 The Naked and Famous are a New Zealand indie rock band from Auckland. Their single "Young Blood" debuted on the New Zealand chart at number one in 2010—the first New Zealand artist in three years to do so. The Naked and Famous released their debut studio album, Passive Me, Aggressive You, on 6 September 2010. On 6 December 2010, the BBC announced that The Naked and Famous had been nominated for the BBC's Sound of 2011 poll.